Preparatory class pupils created herbariums of flowers they found in their surroundings. They presented their collective collage to ninth-graders. The activity was carried out with 16 pupils of the preparatory class. 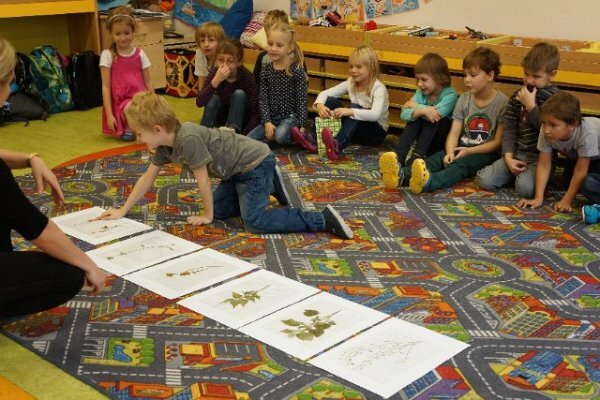 The aim of the activity was to familiarize children with flowers in nature. At the beginning of the activity stood motivation – reading a fairy tale and letter of the flower fairy. Further familiarization with flowers – what they are composed of, what is their function in nature. This was followed by trips to the Stromovka park, observations of flowers in nature, searching for names in encyclopaedias, collection of some flowers, pressing, creating herbariums and visual teaching materials – laminating and description of certain flowers. Furthermore, we, together with some parents, visited the Botanical Garden at Albertov.